I probably don’t need to remind you that we OTs do incredible work every day. We help our clients regain agency over their health and their lives—and, in the process, we are able to instill a degree of hope that many have not felt in a long time. Important as it is, documentation can be time-consuming—which is likely why our profession has come to rely quite heavily on the use of OT abbreviations. When we’re furiously typing our notes between patients, or cramming our documentation in at the end of the day, it’s such a relief to be able to type “CGA” instead of “Contact Guard Assist,” and have peace of mind knowing that our peers and insurance reviewers will understand what we’re talking about. Abbreviating commonly used phrases can save us hours by the end of the week, and this article serves to cover the most frequently used ones—that means you can use them with confidence and spend less time documenting! It’s important to keep a few things in mind when you use OT abbreviations, though. First of all, documentation is very facility-specific. What might make total sense to a team of OTs working at an inpatient rehab facility might look like Greek to a team of OTs working in a hands clinic. Similarly, some insurance reviewers might not recognize lesser-known OT abbreviations, which could lead to hold-ups in your reimbursements (or could even lead to denials altogether!). Plus, as you can probably imagine, it’s even more challenging to decipher OT lingo when you’re not in the rehab field. After we’re done typing our notes, they’re often sent to other health practitioners down the road, and these clinicians might have no idea what our shorthand lingo means. At best, this can cause delays in care—but at worst, this can cause dangerous miscommunications about patients’ health. And we’d never want that to happen. I put this OT abbreviations article together so that you’d have a reference to help save you time and eliminate headaches during your documentation process. However, please keep in mind that while I tried to limit this list to abbreviations that pretty much any rehab professional would recognize, many of these terms will still be very confusing to non-therapy professionals. For this reason, I’ve also included some hacks to help you speed up your documentation without relying on questionable OT abbreviations. Instead of using questionable shorthand that could lead to confusion, I recommend that you use a text expander! Fusion Web and WebPT both offer this capability! I’m also curious to know of EMRs that do this, so please comment below if your clinic’s software has this convenient feature! You can use the OT abbreviations list below to create your shortcuts, and also come up with ones of your own if you’d like. 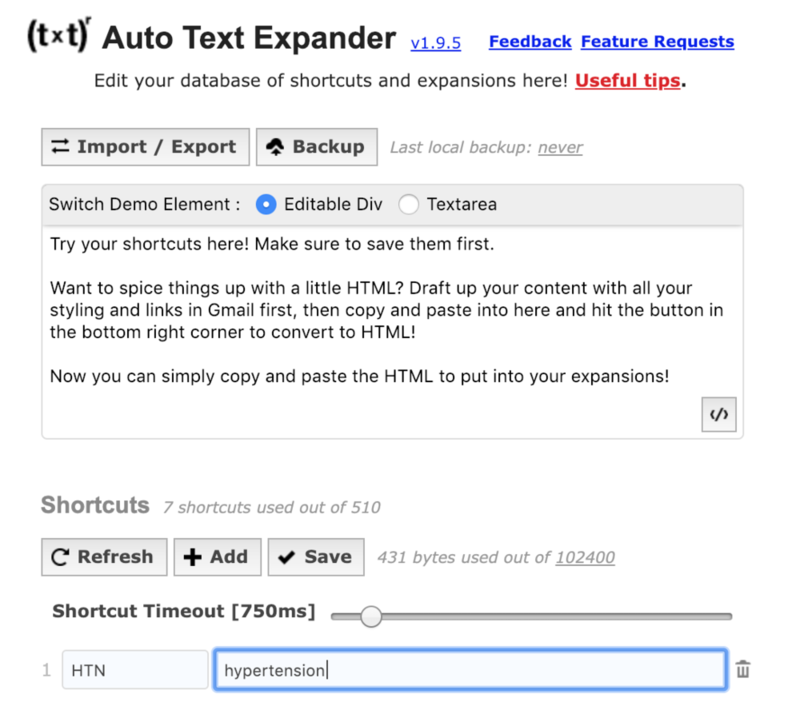 If you use the Google Chrome web browser for your documentation, you can install the auto text expander extension, which allows you to easily create these custom shortcuts! Here’s the auto text expander. Download the chrome extension for free from the Google chrome web store. Under the “shortcuts” section, click the “+ add” button and set up the shortcuts or abbreviations you want to use (I used “HTN” as an example for “hypertension”). Be sure to hit save after you add your abbreviations! And keep in mind that it’s case specific, meaning you must type HTN; htn will not work. Use the exact (case-sensitive) shorthands that you pre-designated in the extension, and see how your typing automatically expands...it’s like magic! Keep in mind that this hack only works for browser-based EMRs like WebPT, and if you use other documentation systems like Epic, Centricity, or Cerner, you may or may not be able to do something similar. So here’s what I recommend in those cases. I strongly recommend that you ask your IT department or software liaison if you can do something similar to what is possible in those web-based EMRs. For example, PhraseExpress integrates with systems like Allscripts, Cerner, and NEXTGEN. Chances are, whatever software you’re using for your EMR, there is an option for you out there that will make your life way easier. Yes, I realize that taking the time to work with an already-busy IT department or EMR trainer means extra work for you. And it might be one of those things that takes months to accomplish. Not only will your coworkers and supervisor sing your praises from the top of the hills when this is all over, you’re quietly establishing yourself as a key problem-solver on your team during the process. You’re demonstrating your ability to collaborate and liaise between departments––and to streamline processes and improve departmental productivity by eliminating documentation bottlenecks. Taking on these types of roles helps immensely when pursuing non-traditional or non-clinical OT roles in the future, and your initiative will likely score major points, should you have your eye on a leadership role down the line. Without further ado, here’s the list of therapy abbreviations! Remember, use them wisely, and try to use fully formed phrases whenever possible, in order to prevent confusion! Here’s the thing. You might not have seen some of your favorite therapy terminology on this list. I left some things off the list because they’re likely facility-specific, and use might lead to confusion. For example, “tx” could mean “traction” or “treatment,” and using traction when it’s contraindicated could be very dangerous. That’s why I recommend that even when you use well-known abbreviations, you consider using the aforementioned text expander features whenever possible. After all, the less confusion we have between medical professionals, the better! I truly believe that leveraging technology in a thoughtful way will eliminate many of the communication barriers traditionally seen in medicine! I plan to update this article over time, and I’d love for you to comment below! Please indulge me and share whether your facility and/or EMR allows you to create your own custom shortcuts! Do you have any tools or hacks you use to make your documentation more legible? I’m also curious to learn whether you’ve ever had an issue from using too much shorthand or too many abbreviations! Thanks, in advance, for your input!